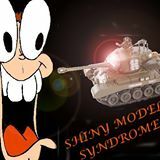 The Shiny Model Syndrome has posted episode 21 of their podcast up online for your listening pleasure. Well then... its come to this, has it? This week we take a break and have a variety show style episode with multiple topics of fun and conversation. We get pretty intoxicated, introduce a new host, give our hopes for the future, and ramble on incessantly. If you've stayed with us this long, or are new to listening, beware that this episode is nothing like what we do regularly. But every now and again its fun to let loose and let your nerd colors fly. Enjoy and thanks for sticking with us!